i have a 5 month old german shepherd female. i only had for about a week and she follows me everywhere, sleeps with me,and watchs t.v. with me.she is the sweetist dog ever!!!!!!!!!!! about the 4 day i had her i was walking her and a boxer came and tryed to attack me she attacked him and they were fighting in the middle of the street. the owner of the boxer was laughing. i got the boxer off my dog and kicked him so hard he flew to his house. in the end shiloh helped me and i helped her. if it was not for her i would have got attacked and i helped her ... so now she is about 8 months now we are closer then ever!!!!!!!!!!!!! 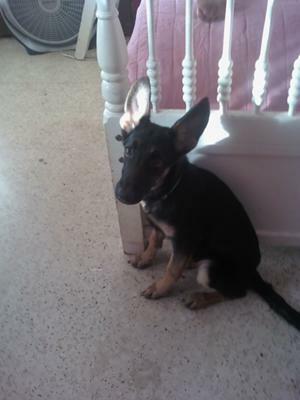 (the foto is when she was 5 months old) i love german shepherd!!!!!!!!!!!!!!!!!!!!! !